My mother was born Enid Oliver in 1905 at Barlaston, Staffordshire, where her father, the Rev. Alfred Oliver, was the vicar. She cut her first jigsaw in 1915, aged ten. She and her younger sister, Mary, had been given a Hobbies A1 treadle machine (cost 7/6d). They first cut jigsaws for charity and among her possessions I found a letter dated 1916 from the exiled King of the Belgians, signed by him and thanking her for the 1/9d they had raised for the Belgian Refugee Fund. They also took their machine to the local hospital to show wounded soldiers how to cut jigsaws as a therapy. She continued to cut jigsaws for the rest of her life, not particularly intensively during the Twenties and Thirties – she married my father, Rex, in 1929 – but with increasing enthusiasm during the Second World War and afterwards. She cut jigsaws for King George VI and, bearing in mind the care with which she chose the pictures for His Majesty, she was a trifle non-plussed when she learnt that he put them together upside down. 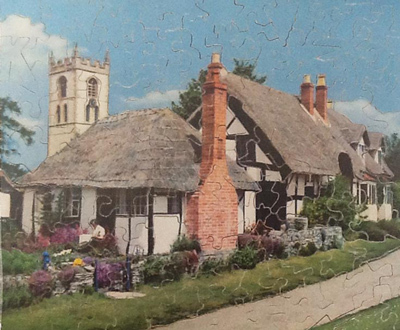 Throughout my childhood in Gloucestershire from the end of the war until I married and left home in 1965, there were always jigsaws to be put together. The surfaces of the kitchen, in which she treadled away, were always covered with a fine layer of plywood dust. From time to time, when either she was glueing the pictures on or covering the re-cycled stocking boxes for the jigsaws with wall-paper, the smell of bone-glue filled the house. There was a steady stream of customers – or rather friends, since they all became friends – dropping in to choose pictures for their next jigsaws. At a very early age I learnt to cut jigsaws and so did my sisters. Thanks to her I have made a living out of it and so did my sister, Mary Rose. And now my mother’s grandchildren are carrying on the tradition and, indeed, her great-grandson, Max, aged twelve, has started to cut them as well. My mother achieved world-wide renown for her skill and artistry. Indeed, when Simon and Jack, her grandchildren, and I appeared on BBC 2’s Antique Show a few years ago exhibiting our jigsaws, she was described as “one of the finest, if not the finest, jigsaw cutters of the twentieth century”. Her jigsaws went all over the world and are now collectors’ items. She cut her last jigsaw just a few weeks before her death in 1983. The Hobbies A1 machine, upon which she cut all her jigsaws, is now in my workshop and is still in working order. I have priced the jigsaws at the same rate as our own but only if they are in first rate condition, reducing it according to their wear, the condition of the picture and if pieces have been mended. Wherever possible the jigsaws are in the original boxes made by my mother, but I am supplying a new box for each one as well just in case the original deteriorates. A few have a new box, the original having fallen apart. I have had great difficulty in dating my mother’s jigsaws since I have been unable to find her records, if indeed they still exist. However, the smaller the pieces, the older the jigsaw and, after she broke her shoulder in the mid-seventies, the pieces became significantly larger. Accordingly I have recorded the number of pieces per square inch for each jigsaw. 153 pieces. 9 x 8 inches. 2.56 pieces per square inch. Good condition. Original box my mother put it in but the picture on it has nothing to do with the jigsaw. £38.